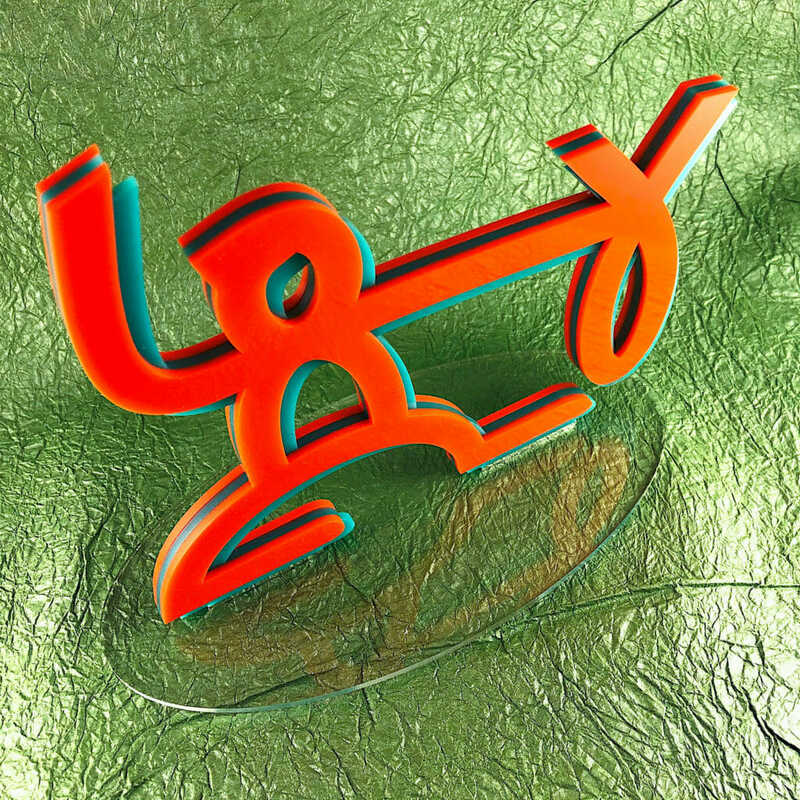 I am working on some identity photos for some friends and, thought a three-dimensional representation of their colorful logo might help with staging what we want. This was a quick project, probably under an hour total and, came out great. 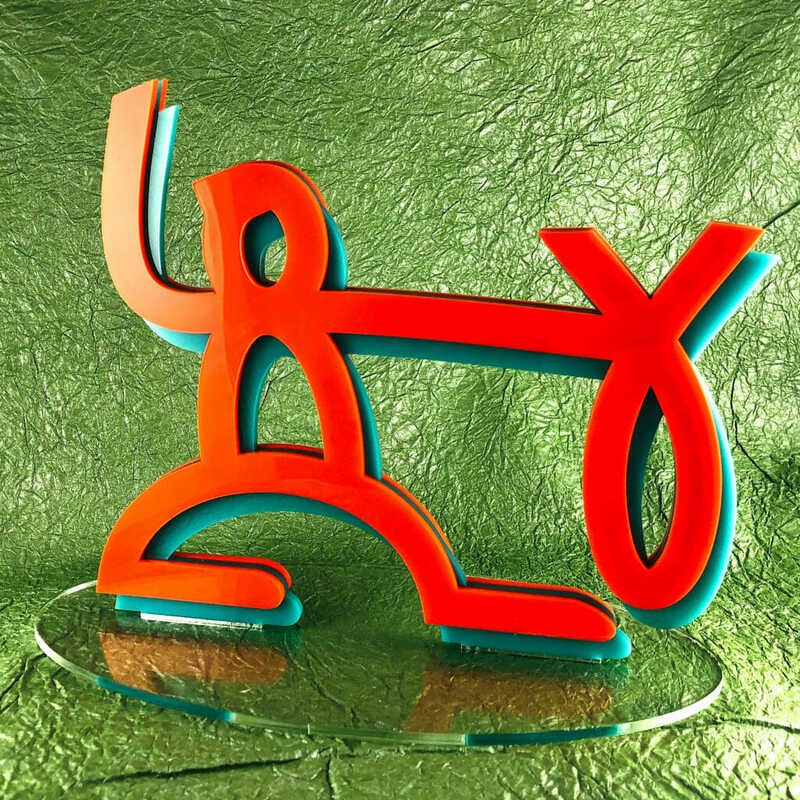 It’s 3 layers of 1/8″ thick acrylic, bonded with acrylic cement. The middle layer is slotted into the elliptical transparent base. The Fishhugger logo is very closely based on a petroglyph thought to be of an ancient fisherman. There have been a lot of changes in downtown Phoenix in the last few years. A lot of history remains. I thought it would be fun to make a pop up design of a local building or two. So, I had a go at the Westward Ho. The Westward Ho is a landmark of downtown Phoenix. The hotel with office space and restaurants was built in 1928 and, remained the tallest building in Arizona until 1960. The steel tower and antenna were added in 1949 to broadcast the first television station in Phoenix. The building was converted to housing for the elderly and mobility-impaired in 1980. 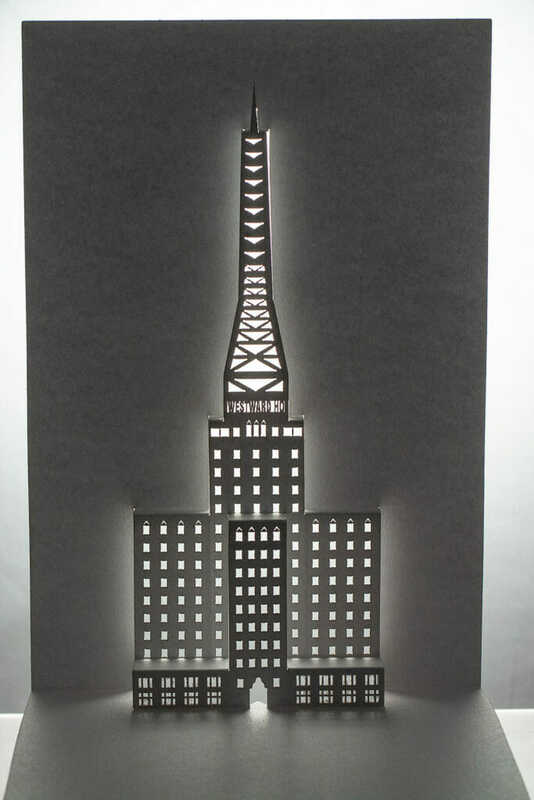 Another one of the twisted-crest style origamic architecture pop up cards I did early last year. This is modeled on the logo for Keyboard.io, which makes a really great heirloom-grade ergonomic keyboard (the Model 01). This one was done on the new Glowforge, which made some of the finer details a lot easier. 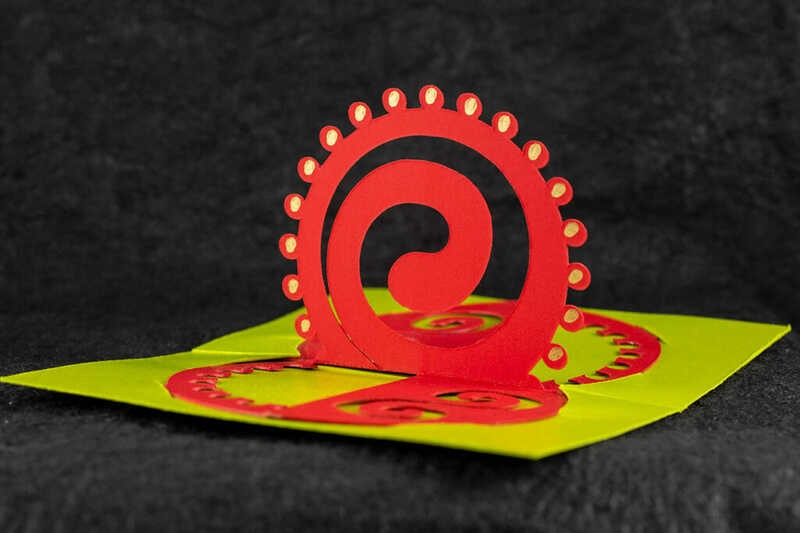 Keyboard.io logo 180-degree open twisted crest origamic architecture pop up card. In keeping with tradition, here is my 2017 holiday card. This predates the new Glowforge by a few months. So, it was done on the Gazelle cutting machine. This twisted-crest Celtic spiral pop up was my 2017 holiday card. 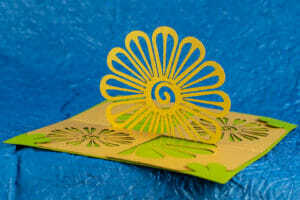 I have been having fun making these 180º open twisted crest style origamic architecture pop up cards. This is a clever technique and, I wanted to invite you to join in the fun. 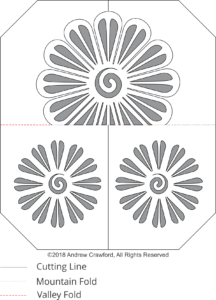 This post includes patterns for my new Flower Crest design, suitable for production on a laser cutter, a craft CNC cutter or, by hand. Most people will have to actually make one of these cards or watch the folding video to get how it works. I originally spotted this technique used for several patterns in Keiko Nakazawa’s 2006 book 3D Pop-Up Greeting Cards (link in the resources section below) and, abstracted it to make my own designs. Rather than gluing to backing cards, I prefer to develop other approaches like what I have done here. 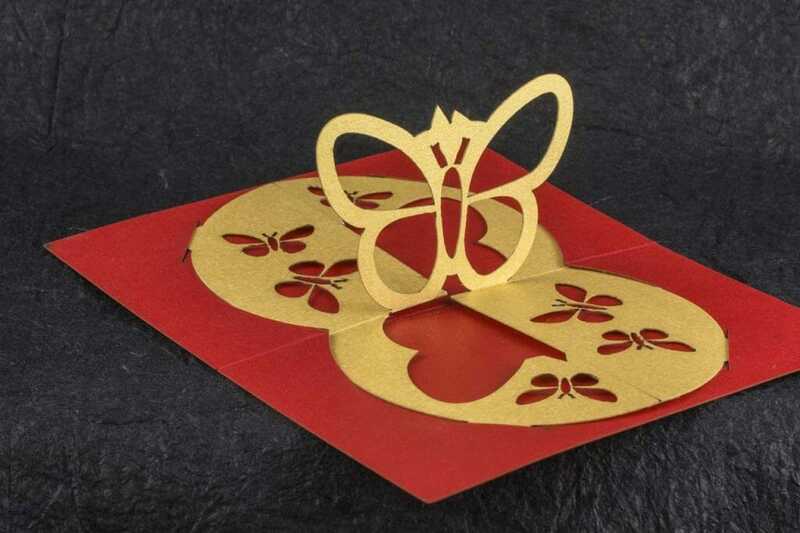 Settings for your cutting machine, whether CNC or laser, will vary depending on your machine, the specific paper stock you are using and other factors. 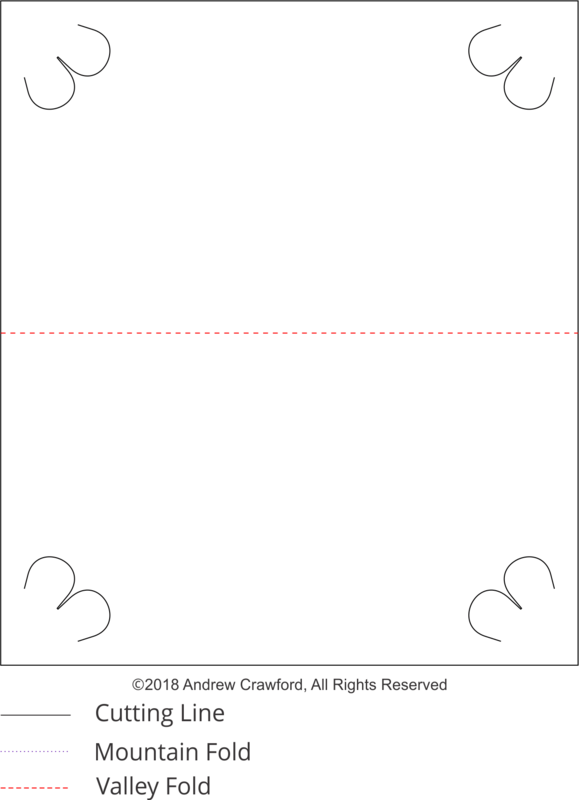 The paper I used for my cards was 0.014″ thick 105lb cover stock. On the Glowforge, I used a speed of 500 and power of 72 for the cut lines and a power of 18 for the mountain fold lines. I scored the valley fold lines on the back by hand with a craft knife. 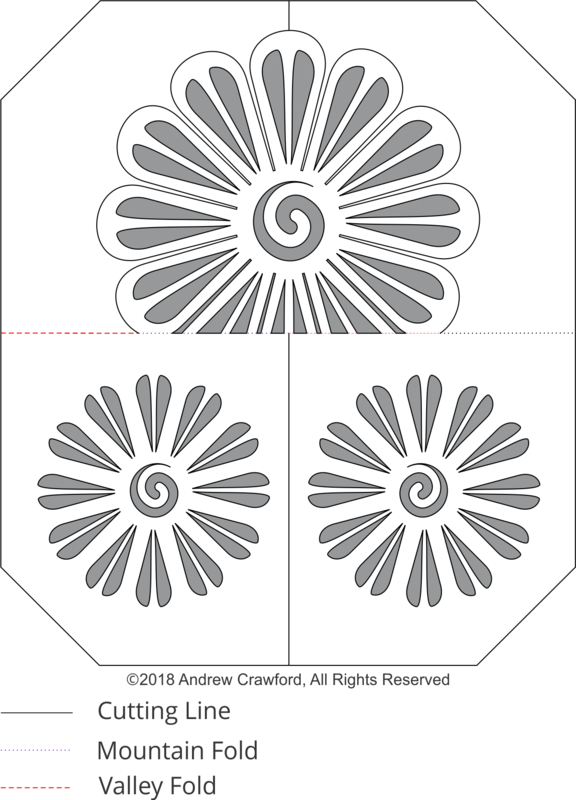 If you are a Glowforge user, you likely have some experience dialing in settings for a particular material. I color-coded the file so that the GFUI will separate and order the operations on import. My settings for each operation for the Gazelle cutter are in the MTC file as layer descriptions (D is depth setting on my adjustable blade holder, V is velocity and F is force). Those will probably be mostly useless unless you are also using a Gazelle cutter with an adjustable blade holder. If you are a craft cutter user, you are likely used to sorting out settings for a given stock. The layers are in the order you should cut them. 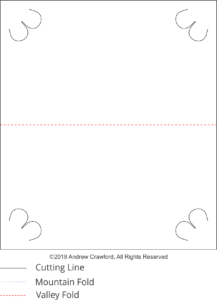 The last two layers are the backing card (one score and the cuts). Important: These files are for personal, non-commercial use only. If you want to produce these to sell or for other business use, please contact me to arrange for licensing terms. Amazon referral links support a local arts organization. Glowforge referral link helps defray my costs of running the studio.